While cruising in the Bay of Islands, New Zealand, we were hiking ashore and came upon an ancient fig tree, laden with beautiful figs, many of which were ripe enough to pick. I filled my small backpack with 31 of the ones I could reach. Back on the boat, we treated ourselves to figs, stuffed with Blue Cheese and melted in the microwave. The following week, we harvested another 31 figs from the same tree, and served them to six of our fellow cruisers in ADAGIO's cockpit. We have found that the melting of the cheese creates a gooey appetizer. So we serve the figs cool or at room temperature, garnished with a dab of cold Blue Cheese, as follows. Check each fig for serious blemishes, but no need to wash the figs. Cut off the stem, then cut each fig into 4 pieces, slicing from top to bottom. Place the 8 fig quarters on a small plate and garnish each piece of fig with a 1/2 tsp of Blue Cheese. Serve immediately as finger food. Liza Copeland, S/V BAGHEERA, served this to us in Desolation Sound, British Columbia, Canada, years ago. 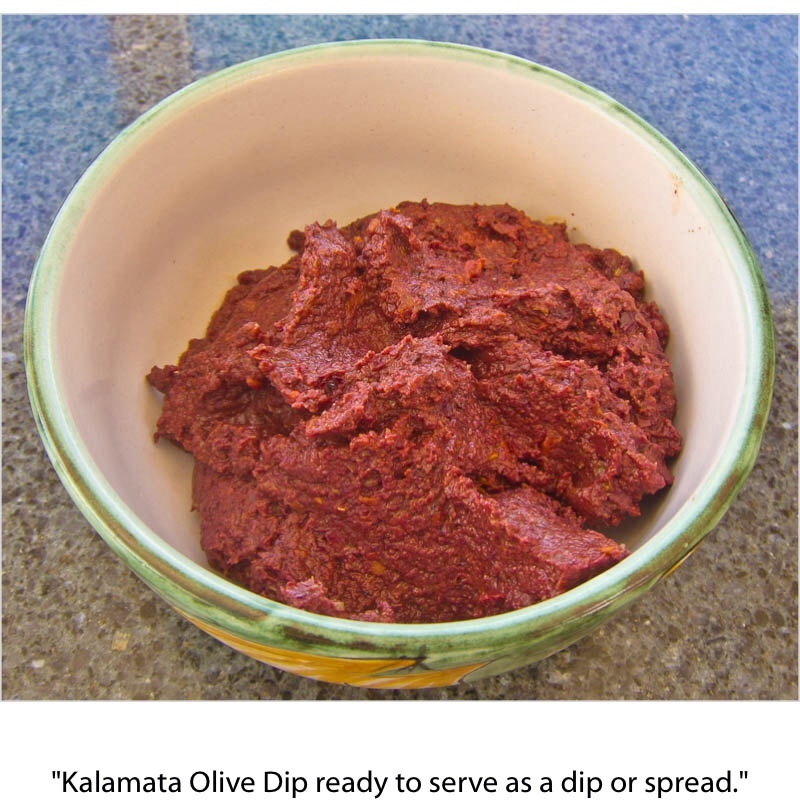 Serve it with plain Saltine crackers, letting each of your guests scrape some of the melted cheese and sun dried tomatoes from the serving plate and spread it onto a cracker. Can't be beat. Place the Brie into the center of a microwave safe serving plate or flat soup bowl. Scatter the Sun-dried tomatoes over the top of and around the Brie. 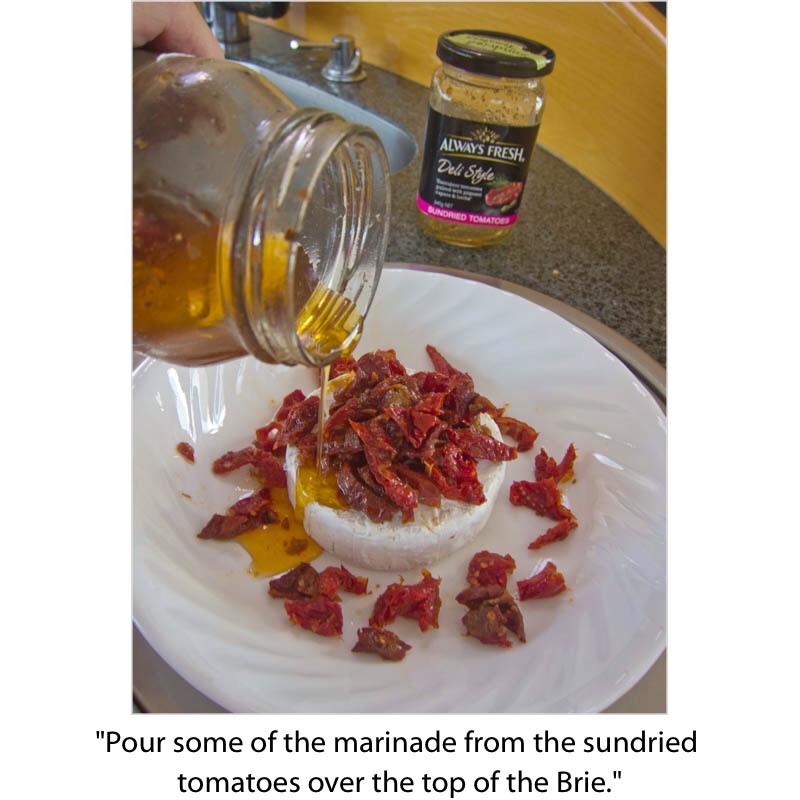 Pour some of the oil marinade from the jar of Sun-dried tomatoes over the top of the Brie. Heat on High in microwave oven for 1 or 2 minutes, or until the cheese softens, but does not become runny. Serve immediately with Saltine crackers. Multi-purpose and delicious, we keep this dip on hand for dips and spreads. It is also the base for gravy for a Lamb dish. I squeeze each olive to be sure that the pit is really absent. I have been known to add anchovies and/or ricotta cheese. Spread on crackers or use as a dip with carrot sticks, chips or crackers. During our first visit to Nelson, New Zealand in 2003, on our way to Alaska, our friend Eva Brown introduced us to Dukkah at a Nelson restaurant. I discovered that I could buy it in New Zealand grocery stores, and we liked the “Egyptian” almond Dukkah the best. 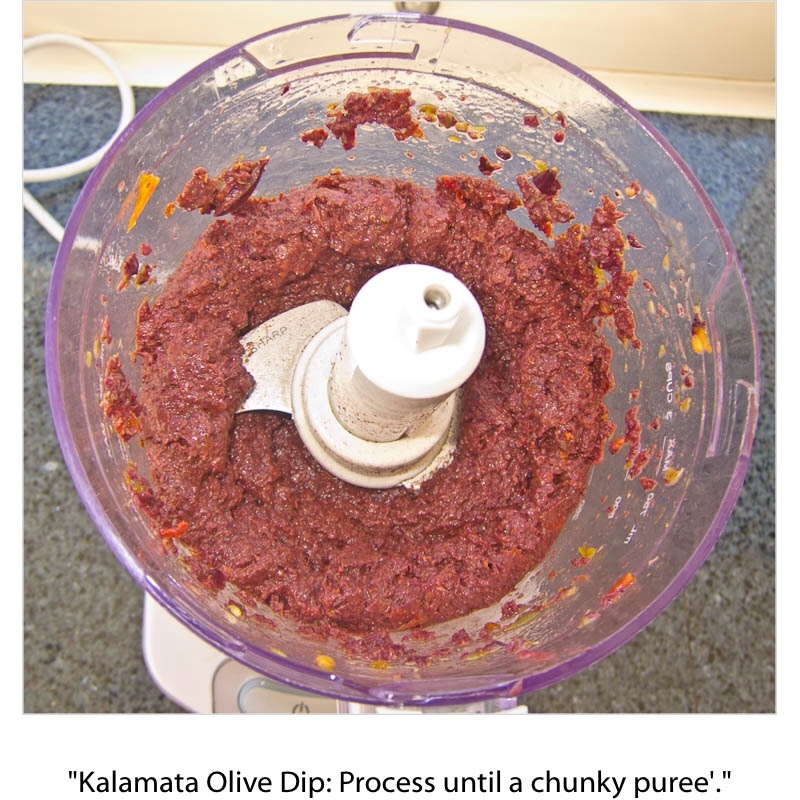 When I decided to make my own Dukkah, we tried many combinations of nuts and spices and the following recipe is our favorite. We have also used Macadamia nuts and Cashew nuts, with different results. Toast the nuts in a hot (250 C or 450F) oven for 4 or 5 minutes, being careful not to burn them, stirring after 2 to 3 minutes. Remove from oven and allow to cool. In the same hot oven, toast the seeds of Coriander, Fennel, Cumin and the black Peppercorns, for approximately 2 minutes, being careful that they do not burn. Remove from oven and let cool. Toast the Sesame seeds separately for 2 minutes. In a food processor, or with a rolling pin and a strong plastic bag, chop and crush the toasted nuts until the mixture is in chunks of many sizes. Do not over process, or you will have almond butter. In a motar and pestle, or in a spice grinder, grind the toasted seeds and peppercorns (not the Sesame seeds which you will leave whole). In a medium-sized bowl, combine the crushed nuts, ground seeds and peppercorns, whole Sesame seeds, Smoked Spanish Paprika and salt. Store Dukkah in a tightly sealed container in the refrigerator. 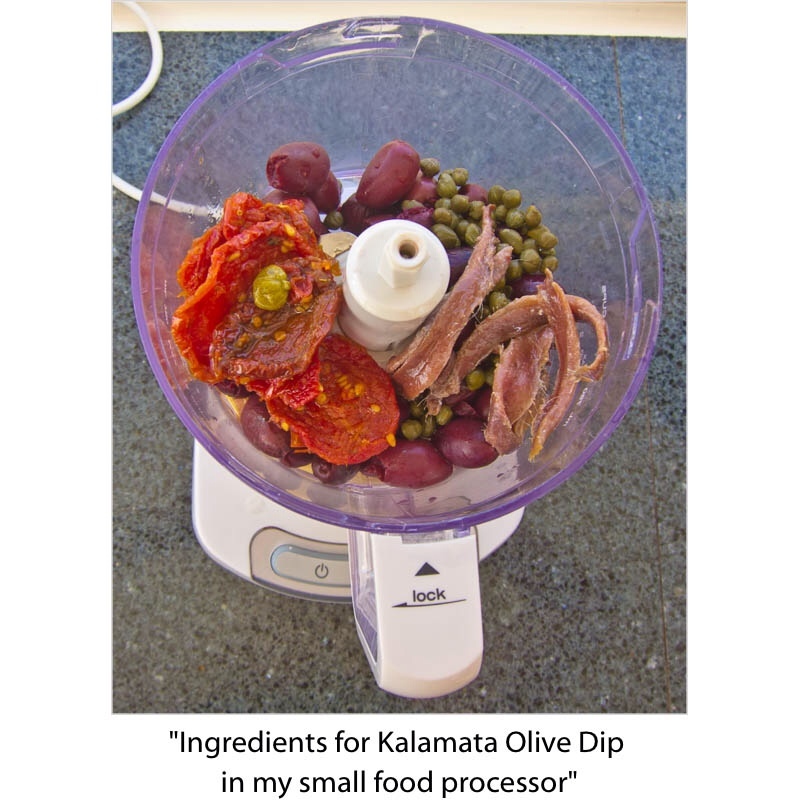 For an appetizer, place Dukkah in a small bowl and extra-virgin olive oil in a second bowl. Dip cubes of fresh crusty bread first into the oil, then into the Dukkah. Or you can dribble the oil onto the bread, then sprinkle Dukkah onto the oiled bread. Another appetizer can be bite-sized cubes of soft white cheese on toothpicks, dipped into the Dukkah. Or spread the cheese onto a cracker and sprinkle with Dukkah. As a main dish, our favorite way to pan fry fresh fish fillets is to coat the fish with oil and sprinkle liberally with Dukkah on the top side, after you have placed it in a hot pan. Cook the fish on one side; turn it over; sprinkle with more Dukkah, and cook quickly until just not quite done. Add a little more oil around the edges of the pan if the fish begins to stick to the pan. The fish will finish cooking on your heated plate. Scrape all of the nuts and spices from the pan onto the top of the fish on the plates.